literary, artistic, or musical form. You're arguing details, semantics and legalities, while it's completely clear that lots of content in SC:O is derived (or just straight-up copied) from SC2. Which you shouldn't do if you don't have rights to the IP nor the original creators' blessing. I've no idea how it will be settled in courts, or whether Stardock manages to evade consequences or not, but the basic principle seems perfectly clear in this case. Splitting the hyperspace example into details until they're too small to matter individually, ignoring the bigger picture, and trying to arrive at the conclusion of "we're not infringing SC2" is a huge exercise in mental gymnastics. Game design is not copyrightable. As stated by a worker of the Copyright Office to P&F's lawyer. That letter...I was always on Brad's side, but now I know why his confidence is so high. Design/idea/concept/format/layout is 100% what Toys For Bob is pointing out with the chart they recently released. None of it, based on this letter from the copyright office to their lawyer, is basis for a claim. If it was, then Blizzard could've been sued for Warcraft being too much like Dune II all those years ago, and Microprose could've put a claim in against Brad for Galactic Civilizations being too much like Civilization and Master of Orion. It's simply a road that we as gamers don't want to go down (if so, then Star Control would never have been made, because it's essentially a fancier version of Spacewar!). IP law is so messed up, the only winners are lawers (which btw includes the judge and those in charge of making the laws!) No work in any field can exist in vacuum. Every author has read 100's or even 1000's of books. Infact there are only 7 different type of stories, one of which star control falls under. Every invention requires other inventions; Can't make a light bulb without electricity. Oh, and btw, there are fair use reason to legally copy copyrighted works. (this has been chiseled away because of lawyers) But if say Stardock make a game that was a parody of Star control, like how space balls is to StarWars(there is even an X rated film that does this, G. lucas fought and lost btw)... Anyways as I was saying, Stardock could make a Star Balls making fun of Star Control, they can get away with stealing those characters, story elements, etc. This isn't just a game thing. In a previous job, a client licensed our software, copied the design and functionality over the next year, (including asking us how things operated at a low level in the program ans using it to make design/coding decisions). Then dropped us and announced their product after scraping their data in the middle of the night. Anyway, we had NO copyright claim. This whole thing is utterly ridiculous. Anyone with even a basic understanding of copy write law should know better. Well I hope everything turns out well for you Brad. I’m looking forward to buying Star Control: Origins on GOG when it comes back, hopefully in a short time. It is nice to see the internet / forums are still producing absurd comments though. I was worried that humanity might actually get its act together for a second. What seems to be overlooked in a number of posts is that the judge has upheld the DMCA claim. The court seemed to be fairly clear in its opinion that Stardock’s arguments were flimsy at best and irrelevant at worst. This property has been in the courts for over two years, with no resolution. Why Stardock would ever develop a game without a clear, contractual, understanding of who owns what seems the height of ridiculousness to me, but that ship has sailed. It seems to me that Stardock should have accepted a settlement when they had the chance. At this point, Reiche and Ford now hold all the aces. They can pretty much demand any settlement terms they want, if they choose to settle at all. They may just choose to let SCO be banned from sale and call it a day. No, that is not what the judge ruled at all. And barely 1 year has passed in the case. Perhaps I misunderstood the judge's opinion in the case, but rather than argue the point I will simply link the court's ruling. I will call your attention to page 10, reference 21-28. Reiche and Ford first initiated legal action in December, 2017, so I stand corrected on that point. Given that they have consistently refused to license SC2, or its related materials, for 25 years, I don't see them having a change of heart now. With the DMCA in place, all they have to do at this point is wait. The case has entered the rather murky area of "look-and-feel" at this point, and that is an area of law where companies have been suing one another since 1986. Don't get me wrong, I'd love to see Stardock, Reiche, and Ford all decide to come to a compromise that let's both parties make their separate games, and feel their IP is protected, with no further threats of legal action. After all, that would be the best possible outcome for the gaming community. Sadly, at this point, that seems like the least likely outcome of all. All the judge did during the injunction hearing is deny stardock the ability to prevent DMCA takedowns. They said stardock broke the status quo by releasing the game with ongoing proceedings yet to be resolved. However, now that the DMCA has been used, Stardock are fully entitled to publish a DMCA takedown if Reiche and Ford release their precursors game. DMCA notices are issued under the penalty of perjury, which is why dodgy and poor DMCA notices never go to court as the issuer would be in trouble. They have to issue the notice in the knowledge that they own the copyrighted material. Most likely Stardock will issue a counter notice claiming that the DMCA notice was done in error. This then puts the next step back on to R&F as they traditionally have 10 days to decide if they will contest the DMCA notice in court. If the DMCA notice is not contested at huge expense, we are probably talking a $100,000 or more, then the item can be returned to the store. If it goes to court then a judge will have to view the complaint in detail. However, as you have to make the DMCA claim and counter claim under the belief that you own the copyright, whoever loses will be subject to damages, potentially all court fees for the other side and a right royal mess ensues. This is why most copyright cases are dealt with via settlement before court begins because losing is expensive and could lead to bankruptcy, job losses etc and can be crippling. There is currently too much emotion between both sides for a mediated settlement to work as the case is driven by a desire to be right. Same way divorce proceedings get messy because one party feels wronged or felt invested in the marriage more than the other. Hopefully something can be settled out of court, though it is very disappointing to know that people are losing jobs over this, just after Xmas when we all know life is tough for a couple of months. My thoughts are with those who lose employment as they are the ones who have suffered the most and have to find their feet again, no matter what you think of either party. I hope that the DMCA counter notice scares P&F enough that the DMCA is reversed within those 10 days. 10 days off of Steam might be short enough that damages are negligible and those Stardock employees can be rehired. If that doesn't happen I hope there is NO out of court settlement, the trademark to SC is found to NOT have reverted from Atari to P&F because Atari made that cheap flash game to extend their hold on the IP, and P&F have to pay damages to Stardock. The trademark never could have reverted to P&F in the first place. This is one of the nonsensical pieces of FUD that their initial PR campaign threw out there that continues to cause confusion and the like and that their supporters continue to latch onto in search of something that can be used to justify P&F's legal position. Every single piece of legal documentation that describes the agreement between Accolade and P&F make damn clear that P&F never had claim to the trademark. Indeed the licensing agreements explicitly note the trademark itself is excluded from any IP rights that P&F might possess from the games. And frankly every time anyone on either side makes the suggestion that the trademark ownership might be in question, were I Brad, I'd be tempted to tack on another zero onto the settlement I'd want extracted from P&F for trying to do an end-run around IP law. At this point I'm starting to feel that P&F need to be made statuary examples of how not to attempt to handle an IP dispute, much as the SCO Group (the irony abounds) was made an example of by Novell and IBM over the stupid Linux copyright suit. So their main complaint is that stardock made a Star Control game (which they own the trademark to) look very similar to a previously made Star Control game? Im shocked. How dare they look similar! How many of you enjoy Stardew Valley? I certainly do! It reminds me of (gasp!) Harvest Moon. It has dating, it has farming, it has ranching, and it has magic. In fact, the gameplay is more or less the same as Back to Nature or any of the more recent Harvest Moon games (except with better introduction and treatment of adult themes such as where children come from and substance abuse). But the mechanics are definitely identical at certain levels in terms of tool use and how crops work. That is a unique idea, but alone, I do not think that should be copyrighted on its own. I would have a problem with SC:O if Stardock literally went into the source code of UQ:M or SC2, downloaded it, and pasted it into SC:O. That direct form of source code copying is blatantly IP problematic and there are actually a fair amount of issues from the other SCO (the Unix-Linux controversy). I also would have had a problem if the game was a literal retouching of the SC2 game (basically bringing the SC2 into modern graphics and hardware standards) without some idea of how the copyright worked. But if that's what PR III and FF are claiming as exclusive, I really don't want them to win, not just because of the particular case, but I like variations on a theme. If mechanics and graphics were that tightly coupled, we would have never seen DOTA (as they are literal ripoffs of Warcraft III offending all the categories above) or its descendants. 1. The claim is not that specious, there has to be more to it and if not, that's real barratry on their part. 2. I don't want method or resemblance to be copyrightable as it would shut down variations on a main theme (4X, Farming Simulator, Rail Shooter) that I don't want to contemplate. By the way, that is not to say that I don't have issues with SC:O as a founder, I do, and it's posted on the Boards with the bug posts and frustration about certain directions not being possible without prior knowledge and of exploration not being rewarding enough in the near sectors (the bugs especially the rushed beta issues of the 1.0 release which the 1.2 release should have been the shipping version which hopefully will be a development studio after action lesson for next time). But really at the end of the day, I want to see more in the SC universe. We have waited too long for a game since SC3, and I would like to follow this universe to a narrative end, especially, what does happen to the Alliance given SC3's ending? This isn't specifically a list of things that Fred and Paul think that they can individually claim any sort of ownership to, but, rather, a claim that the mechanic that is used by SC:O is essentially identical to the mechanic used by SC2. And it is. This, combined with a slew of other similarities, is where the objection lies - not in the individual nature of each mechanic. And you honestly cannot say the game did not directly copy the hyperspace mechanic from its predecessor. It is the statement of direct copying that is the body of this *example. * There is a reason, however, that we did not see any discussion of solar system travel, or lander missions. Both of these mechanics have already been adopted by Mass Effect, and were never particularly unique to Star Control in the first place. I'd be extremely surprised if nobody at Stardock was aware of Mass Effect's take on lander missions. There are still tremendous things that were taken directly from Star Control 2 and added to SC:O without much editing, if any. That includes the Zoq-Fot-Pik and Zebranky, as well as the Orz. The concepts of *above* and *below*. We've even seen the series use Quasi-space already. Star Control: Origins goes out of its way to remind us that it is set in the same universe as Star Control 2, and insofar as that universe is properly composed of the IP that F&P lay claim to, it's not going to be solved by ridicule. Except mechanics are not copyrightable, or else Star Control 1 and 2 could be held liable for stealing its look and feel from Spacewar! So if mechanics/look/feel is the basis for Fred and Paul's claim, they're being very hypocritical. No one is claiming that Stardock hasn't made a game is that is very much like Star Control. But many of are saying this isn't an actionable offense. How many of you enjoy Stardew Valley? Star Control 1 and 2 could be held liable for stealing its look and feel from Spacewar! It's one thing to make a game that belongs to a specific genre, a game that is inspired by other games, and/or a game that copies a gameplay mechanic or two from elsewhere. That's very common and acceptable. It's another thing to make a game that directly copies a major amount of its elements from another single game, down to proper names and whatnot, so that it's essentially sharing the same IP (even if it technically isn't). That can also be perfectly okay if there's a mutual understanding between the creators. If there's a legal war instead, it's not okay. As for individual copied elements, it's of course difficult to draw lines, and there's lots and lots of grey area. That's why if it goes to court, it isn't examined only at the level of individual tiny details. It's weird to pretend like there isn't any difference between these two approaches. To pretend like SC:O just happens to be in the same "space exploration genre" as SC2, and that's all there is to it. Of course that's not the case at all. If you try to pretend it is, you come across as dishonest or just simple-minded. Some people seem to have concluded that arguments in the direction of "it's just the same genre", "gameplay mechanics can't be copyrighted", "red hyperspace lol" etc. makes this a clear and easy case in court. I'm not at all convinced about that. I haven't got Origins yet. I was waiting til after the holidays then BOOM this happened. I will download from the site when I get the money soon. BUT, I did out of curiosity watch some of the hyperspace footage from a play-through on youtube, and it's very, very different from Star Control 2. Differences: Isometric view instead of top-down, 3d graphics instead of 2d, animated completely differently in terms of streaks or motion/particles, background is 'red' but a very different hue (more faded, more detail and variation), the star 'holes' show the entire system and aren't different shapes in Origins but rather all seem to be the same oval shape, the HUD is completely different, the camera is zoomed out a lot more in Origins, the main ship is not shifted red, alien ships are not black holes but actual ships, the minimap looks totally different. I mean, the music is technically the same song but is such a different arrangement it invokes a completely different feeling (and the composer owns that anyways). Everything in this scene is so generic (stars, ship(s), minimap, basic HUD) that it is very, very hard to claim that you 'own' this design. The only 'unique' artistic expression of this scene is the color red of the background. And that's just a simple color. I get that if it turns out Fred and Paul do technically own the original IP of the aliens/ship designs/lore, things like that....that they have somewhat of a case to win, but from everything I've heard there is very, very little of that IP in Origins. And in terms of the Observers (Arilou), if they aren't named the Arilou, their likeness is grey aliens in a flying saucer (both designs that Fred and Paul do not own). I dunno, if Fred and Paul's new Ur-Quan Masters sequel was actually sitting on the market next to Origins, I would feel differently about this. But they are using a nearly 30 year old game to justify the DMCA take-down of a new one (in their blog they did not mention any specific IP or aliens/precursors, etc). No they are comparing these screens and that's quite ridiculous. Back in the day, when Final Fantasy came out, it was practically the same game as Dragon Warrior. For example, the overworld looked and functioned exactly the same. This is akin to Enix back in the day suing Squaresoft for copyright infringement due to things like (overworld covered in green grass, forests, mountains, oceans, rivers, little town icons that when you walk over you enter). That kind of stuff should never be copyright-able. I feel like the DMCA used + Fred and Paul's claims regarding the design of hyperspace are opening a larger discussion or concern for the games industry. If they do win this case and the ruling is based on 'design similarities' or 'gameplay mechanics', this is going to be troubling for the industry as a whole. A week ago this case was about Star Control, but now it's turned into something the whole games industry needs to worry about, which is not good. Anyway, just my thoughts as a fan of Star Control and a person who was looking forward to this game for a long time. Intellectual property in legal terms has some very clear demarcations. An idea is not an intellectual property unless the law specifically grants protections and privileges for it, it's why it's called "property" in the first place, to designate recognized legal ownership and the privileges associated. 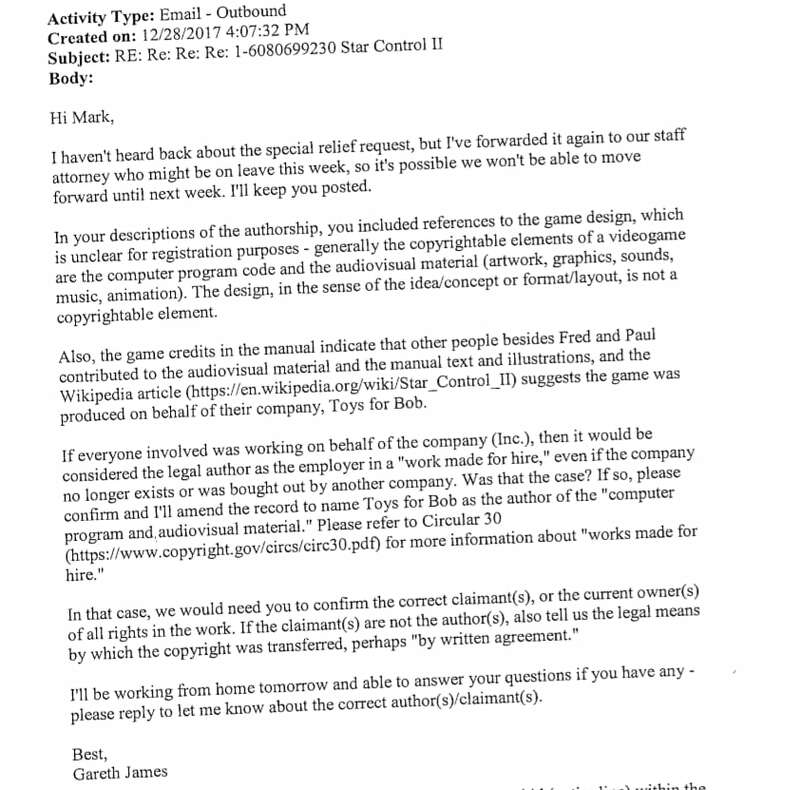 The copyright office itself sent in its assessment of some of P&F's claims, wherein they noted that gameplay mechanisms are not copyrightable, so this isn't just some random opinion of people on the internet, it's the government office that actually has to accept an attempt to register a copyright. If they're not willing to, unless P&F want to sue the US government to try to overturn that decision, none of the "ideas" that they've listed as SCO also making use of have copyright protection. Furthermore, copyright by its definition under the law does NOT cover methods and means. That's the purview of patents. Different types of intellectual property are not interchangeable, and since there does not exist a patent that tries to encapsulate the methods by which gameplay is implemented a SC-style game (and good luck trying to get such a patent approved in the wake of the more stringent review process), the gameplay mechanisms have no legal protections. That P&F might have come up with some original ideas for their SC games is a given (insomuch as they also obviously took inspiration from games that came before them). That does not mean all of their ideas receive legal protection. Star Control II totally ripped-off of earlier games like Starflight, Elite, Planet's Edge and Space Rogue, Up to around 1995-6 games were copied almost 100% regularly. Look at all the "Doom clones"?! Even today, isn't Anthem more or less a rip off of Destiny?! This is just politics and ego's, and only the lawyers will win, Fred and Paul, Stardock and us gamers will be the losers. And on a side note: Stardock better get around to telling us season pass purchasers how and when future parts are going to be released! SCO isn't in the same universe as SC2. It's in a different universe. Stardock has the trademark of star control. SCO is in the same universe as Star Control 2. It's in a different *timeline*. If you've played both games, you'll see that SCO reminds you of that regularly. As a player, I don't mind it and actually consider it an interesting touch! I would love to know what happened to all of the "missing species" in SCO. As an observer to this ownership kerfluffle, I feel like SCO make a lot of effort to tie itself to its predecessor. It does not always copy things somewhat directly. 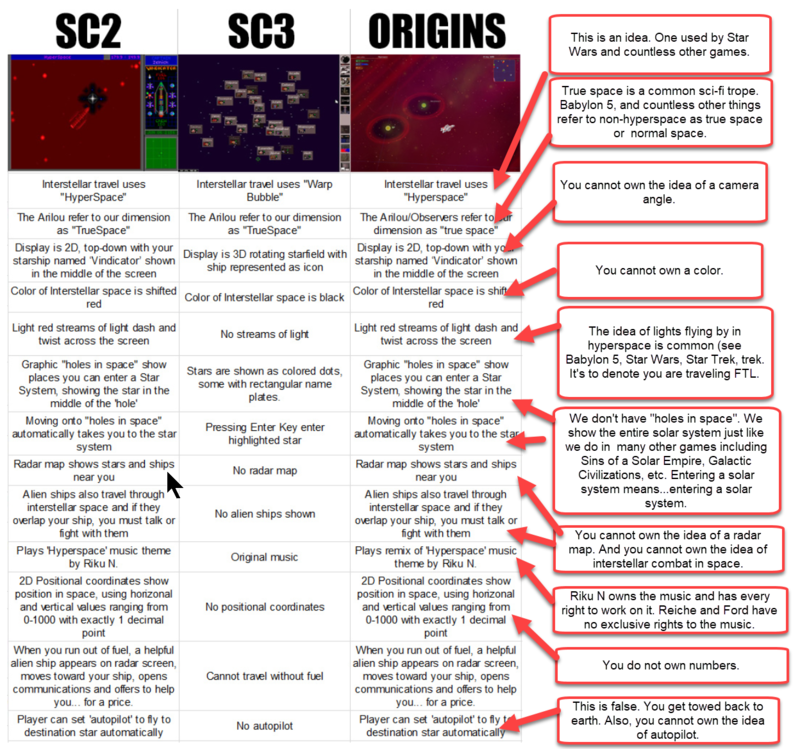 For example, I would think that Star Control Origin's combat is "sufficiently different" to be its own take. Static rather than looping battlefield, multiple gravity wells & new terrain features, radiation field that collapses as a time mechanic. And the ships are sufficiently different. Even the Terran cruisers aren't really disputable, as they were clearly borrowed from StarFlight by Star Control. But the point about hyperspace stands - it is absolutely as direct a copy of SC2's aesthetic as possible.